Stilt House Brewery - Palm Harbor's Neighborhood Brewery! We are proud to announce that we have brewed our 300th batch of beer – a Russian Imperial Stout that will be ready soon! Our Margarita Gose is aging well in Tequila barrels and will be ready in a few months. We also have our pumpkin beer currently aging in Jack Daniel’s barrels and it will be ready just in time for the fall season. For all you sour fans, our Strawberry Rhubarb Berliner will be making a triumphant return soon as well as a new sour release – a Flanders Red with black cherries that we will be aging in our Spanish Oak Syrah wine barrels! Also be on the lookout for a Kentucky Common and a Black Lager to be released this month! Don’t miss the chance to pick up a bottle of our silver medal winning Baltic Porter, “Pagan Night”, as they are running out! 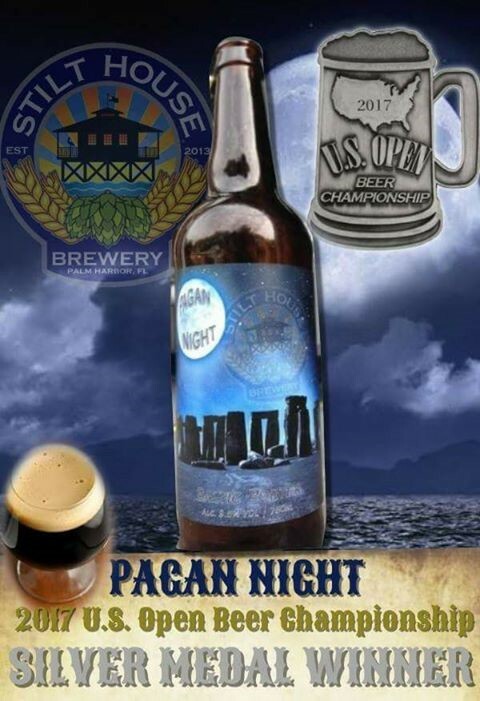 Our Baltic Porter, “Pagan Night”, earned the silver medal in the 2017 U.S. Open Beer Championship – a contest with over 6,000 beers entered from around the world! A MONTH TO CELEBRATE BEER! August 4th, 2017 marks the 10 year anniversary since the inception of International Beer Day (IBD). IBD started in 2007 in Santa Cruz, CA to rejoice in the greatness of beer. August is a month with no major traditional holidays, making it the perfect month to really focus on traditional aspects of brewing and gain an appreciation for beers brewed all over the world. Beer is universal. Did you know, a 3900-year-old Sumerian poem honoring Ninkasi, the patron goddess of brewing, contains the oldest surviving beer recipe, describing the production of beer from barley via bread. It has also been found that in China, residue on pottery dating from between 5400 and 4900 years ago shows beer was brewed using barley and other grains. So let's gather with friends and enjoy the deliciousness that is beer. Let's celebrate the dedicated men and women who brew and serve our beer. Raise your glass to celebrate the heroes behind each tasty brew. Cheers all, Hoppy August! $40 - Covers all painting supplies and 1 beer!